When ordering EMF meters in this site, and from our store site, you get a detailed user manual, video and written info about EMF types, standards and recommendation, testing techniques , radiation reduction and free email support, in order to allow you quick learning of using the meter, while getting from it relevant outcomes, uncovering problems, taking steps to reduce exposure, choosing the right way to protect, testing a tracking the radiation levels in your house/office/workplace. We make the learning easier. You should expect a learning curve, but basically, it is as easy as operating a TV and much easier than operating a smartphone or a computer. 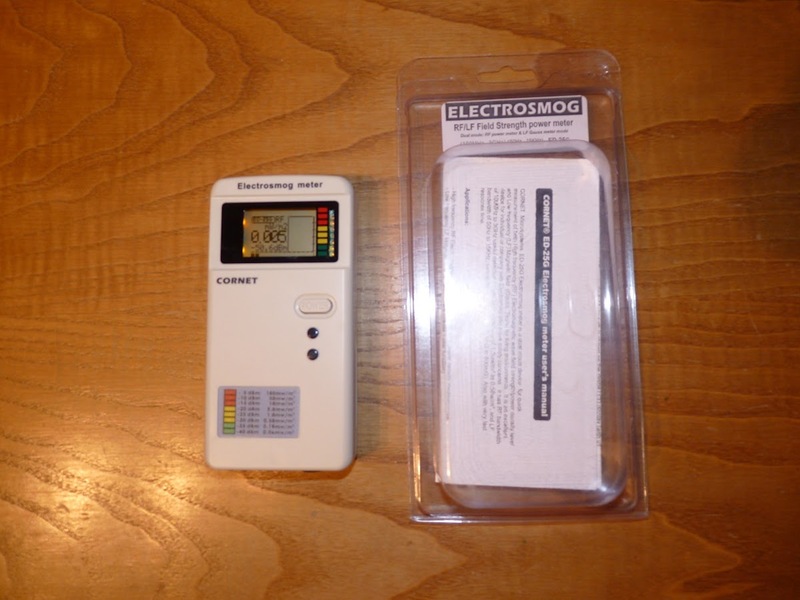 What can an EMF Meter \ EMR meter allow you to do? 1. Allows you to track and find EMF sources inside your house. 2. Allows you to asses the safety distances from ELF sources (in RF there is no real safety distance). 3. Allows you to identify where from EMF is penetrating your house. 4. Allows you to know which devices emit EMF, when, for how long and how frequent. 5. Allows you to make sure that steps you take to minimize your exposure relay works. 6. Allows you to make sure that the protection you are installing relay makes a difference. 7. Allows you to lend the meter to family and friends. 8. 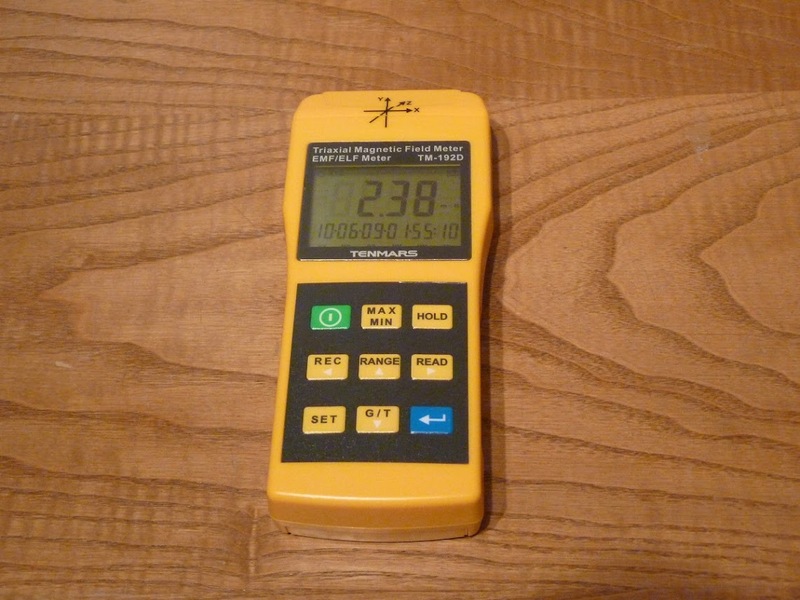 Allows you to measure the EMF whenever you need or want. What is important in EMF meter\EMR meter? 3. Clear Display of the outcome. 5. 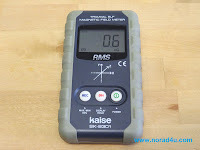 Accuracy - In Low-Frequency EMF meters it is important. In high-frequency RF meters, the accuracy is only secondary due to the difficulty of detecting and measuring today's' fast-changing - low duty cycle signals, because the differences in the way each meter is working, and because of what I believe is wrong calibration procedures and techniques (please see below). What is more relevant in RF meters is the sampling rate (see above) and the meters' ability to sense an RF source from as far as possible (dependable on high sampling rate and sensitivity). What an EMF meter\ EMR meter can't do? As weird as it sounds, most EMF meters, even professional meters and specially RF meters will not be able to show you all the radiation in all the frequencies because of technical limitations such as sampling rate, frequency span, difficulties in measuring multiple sources, in multiple frequencies, all in the same time and more technical limitations (see below for more info). Recommended for Model Frequency response Picture and link Buy now! Home use RF/ELF EMF meter with numeric info! New Stock is expected in early May 2019! Low price Home use RF/ELF EMF meter with Led Light and advanced features via USB connection. For those of you who need a fast & simple to operate EMF detector. For those who in a need to a pocket-size alarm detector. Measure RF, ELF-Magnetic, ELF-Electric fields. USB connection for future features. High-Quality RF Meter for the advanced user that what easy and clear reading, with audio feedback, an earpiece socket, Average and Peak values. Both Led bar and LCD display. The Newer model the "TRI FIELD 2"
One meter for RF+ELF or a single meter for each? The first option, as a first meter is to get one meter that does it all. Want a digital ELF meter? Before I will start explaining, reviewing and telling you about different electromagnetic radiation (EMF/EMR) meters, I would like to point out that I am not trying to sell anything. All the meters that I am going to review here were tested by myself, and I own most of them. I am writing here my reviews and comments about these meters, which I use daily. I hope that if you are looking into buying one you will be able to get some information from this page which will help you to understand the types of meters available in the market and to chose the one best for you. 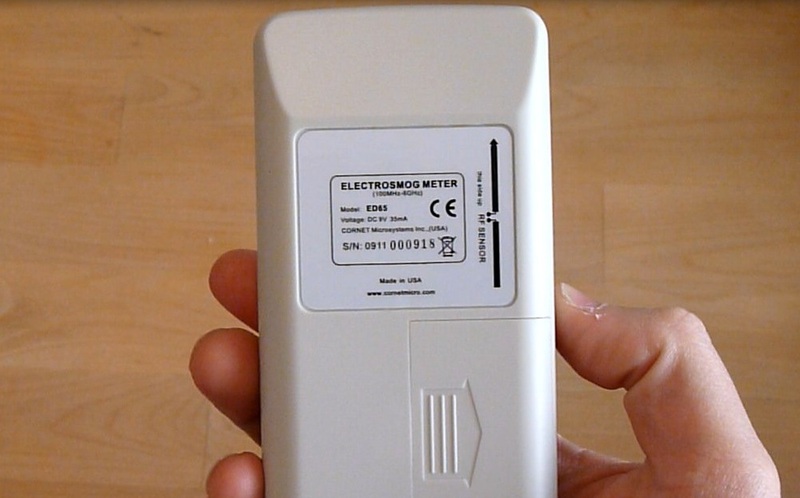 I believe that every household should have EMF/EMR meters since in home of today you can find many EMF/EMR sources. An EMF/EMR meter will help you expose most, if not all of them. after exposing the EMF/EMR sources you can start taking some actions to lower your exposure. EMR is Electromagnetic Radiation, and EMF is Electromagnetic Frequencies so as far as meters it is the same. I believe that buying your own meters is the right thing to do in most cases, especially if you are an Electromagnetic Hypersensitive (EHS) person. The best thing about having your own meter is that it belongs to you and you can use it more than once. You can use it to find EMF/EMR sources in your house, workplace or outside, just whenever you want or whenever you need. You can use it to track and monitor the changing levels of EMF/EMR during a few days or even help your family and friends by measuring their houses. A simple EMR meter can expose real EMF/EMR problems which can then be solved by you (moving or removal of the sources or protection from the EMF/EMR emitted from them). In addition you can take them with you when you are out, buying new equipment for the house in order to make sure when and how much EMF/EMR the new equipment will emit (for example this is the best way to find out which cordless phones emit EMF/EMR all the time and which emit it only during conversation). I believe that today every house should have at least one ELF+RF meter or two meters, one for Extreme Low frequencies (ELF) and one for radio frequencies (RF). 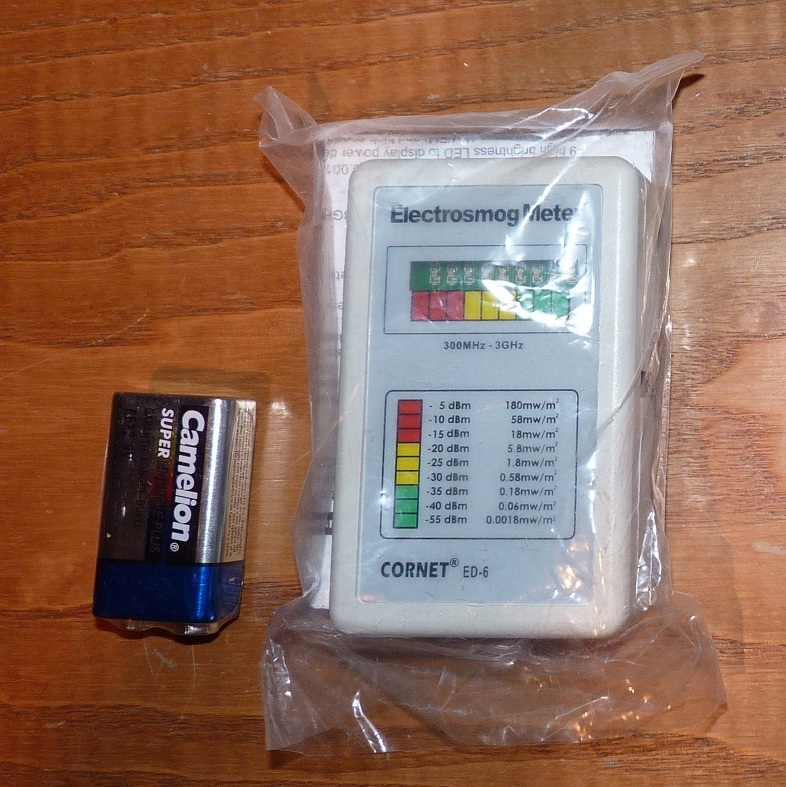 A simple to operate CORNET ED88T, sold under $170, LFE+RF EMR meters should be enough to expose most EMF/EMR sources in your house or workplace and to give you a good picture of what is going on around you as far as EMF/EMR is concerned. Advanced meters can be right for you if you have some experience in the measuring of electronics, and after you gather some experience and knowledge about radiation. These meters are usually strongly built, have a Tri-axis sensor, are far more accurate but suffer from low sampling rate and therefor will have problems detecting in house RF sources and cell phones. If you are looking to buy electromagnetic meters and searching for a place to buy at, I can recommend our new eStore web store. In addition to that, you are welcome to use the links that I will give in the bottom of every review. Some of the meters can also be purchased at No Rad's Amazon Store. 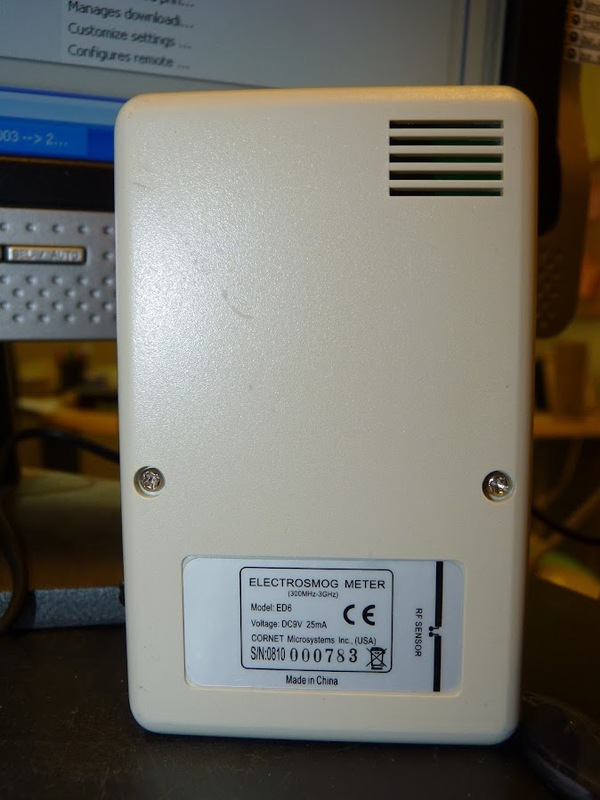 Very Simple EMF/EMR meters – Into this category fall all the indicator type meters. These very simple meters can show you if there is or is not any radiation, a lot or not so much, more or less. These meters have a very basic indication, usually a set of leds or a small gauge. Amateur EMF/EMR meters – simple EMR meters that in addition to a basic indication gives also a numeric measurement value. Advanced EMF/EMR meters - EMF/EMR meters that display different types of information on a specially designed LCD. These meters can usually measure EMF/EMR in 3 axis and have advanced features like HOLD, MAX, AVERAGE. Some of them even have an internal logger (able to track EMF/EMR levels over time) option and can be connected to a computer for data analysis. Professional meters - high quality, advanced meters with high precision and accuracy that address the professional market needs. These meters will usually have many advanced features some programmable options. to shield and how to reduce your exposure from them. Highly recommended for EHS people! This tiny EMR Meter is more of an EMR alarm device that will notify you whenever it detect EMR levels around it. 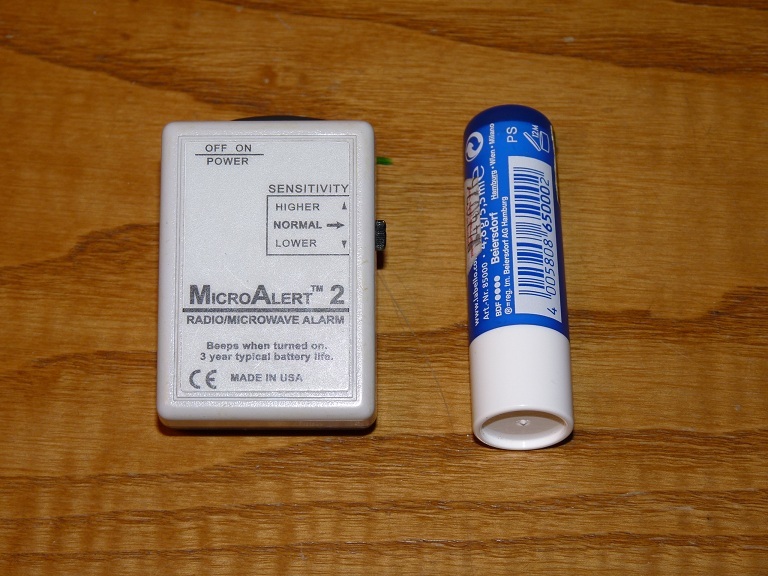 The MICROALERT 2 has no numeric or light indication, it simply beeps when it is exposed to EMR. If the EMR levels are low it will beep slowly, if they are high it will beep very fast (similar to a Geigar Counter). The meter is so small it can fit into your shirt pocket (and leave some place for your turned off cell phone when). On the right side of the MICROALERT 2 is small knob button that controls the sensitivity of the meter. On the upper side you can find a On-Off switch and a small hole outlet for the small speaker. In order to open up the MICROALERT 2 you need to open the screw on the back side of it. This will reveal a small electronic board and a small battery which, according to the manufacturer, will last for 3 years or normal use. The MICROALERT 2 also comes with a small detachable hook that can be attached to his rear side and can be used to attach it to your belt or shirt, but I don't believe it can hold. I think MICROALERT 2 is best to be used by EHS persons as an RF EMR alarm system, or as a basic indication meter for searching and exposing EMR sources. I "ware" this meter to work every day and it alerts me whenever someone uses a GSM mobile phone next to me. For those of you who need a fast & simple to operate EMF detector. For those who in a need to a pocket-size alarm detector. Measure RF, ELF-Magnetic, ELF-Electric fields. The USB connection for recording measurements, software upgrade and more. A very small, fit into your pocket, very fast and sensitive EMF (both RF/ELF-M/ELF-E) Radiation detector. 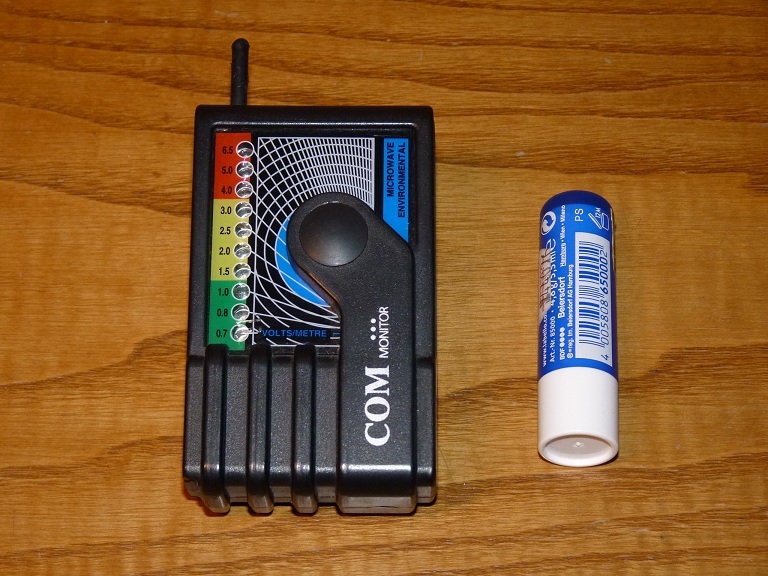 Can be used as a simple EMF Smog meter, showing the levels via cthe olor led bar. 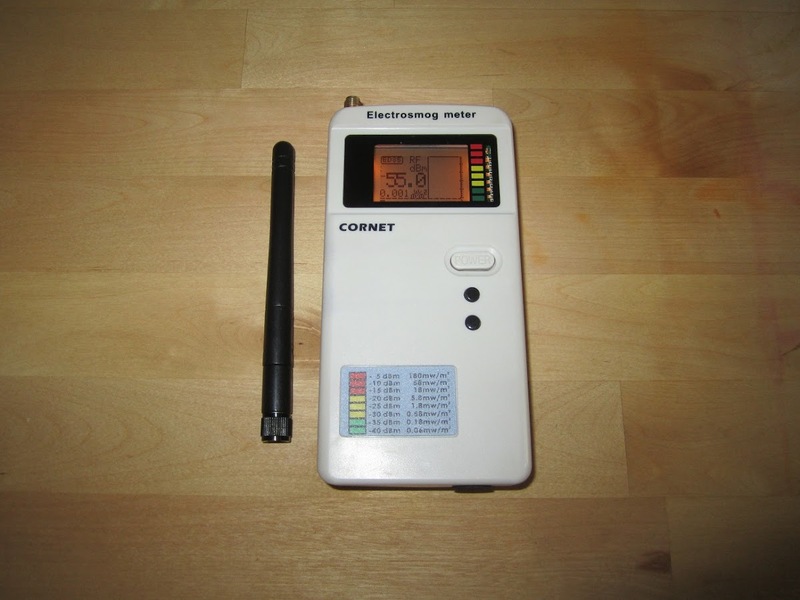 Can be used as an Alarm RF/ELF detector for EHS (Electromagnetic Hypersensitivity) people. Can be used as a monitor while connected to a PC via the mini USB cable. Has an Internal rechargeable (via USB) battery that can last for hours. The fast sampling rate will allow the meter to pick up even the fastest RF signals. The meter display the levels of EMF over a Green-Yellow-Red Led lights, making it easier to read even if you are not an expert. If you are an advance user, you can connect the meter to a PC and get the exact readings. Very fast sampling rate- Most important (20000 sampling every second).! Both RF and ELF (magnetic & Electric fields) in one very cheap meter. Super sensitive RF alarm mode will allow you to walk around with the meter for hours. The meter will alert you when being in a high RF environment or close to a source or a cell phone user. Sampling rate: 20,000/sec, display rate 5/sec. 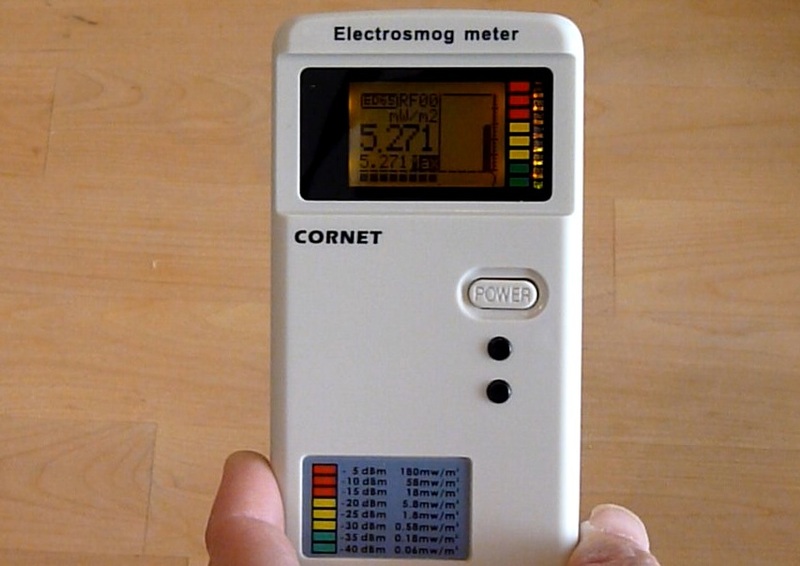 Great & cheap EMF detector for those who need a Red-Yellow-Green indication, for those of you who need the alarm, or for those who what to do some monitoring (with a PC). RF technologies: Analog RF and Digital burst RF (GSM, TDMA,CDMA, LTE, DECT, ZigBee, Bluetooth, UWB, Wi-Fi, WiMAX 2.4GHz, 3.6GHz, 5.8GHz, 2,3,4 generations). Most recommended, all in one, home use, RF/ELF-M/ELF-E EMF meter (03-2018)! All in one, both RF(100MHz-8GHz) and ELF (Magnetic and Electric fields) with high sampling rate(5000 per half a second), RF Frequency meters (100MHz up to 2.7GHz), adjustable Led bar, adjustable Alarm, and 2 Average mode in RF mode(last 15 seconds and last half a second), Audio Feedback( in RF mode) , max and current measurement functions. New Features: Bigger LCD display, Better plastic structure, Easier to operate, Earphone plug, Micro USB socket for advance uses (Monitoring via PC). Bottom line - A great all in one home meter for those who like to have detailed LCD display with nomatic values. ELF Magnetic mode LF30 - from 40 to 1000Kz and up to 10mG (very sensitive ELF mode). Histogram graph (level/time graph) shows the values measured in the last 15 seconds. Helps you see fast signals and how the radiation levels change over time. Great for RF/ELF source-hunting. The CORNET ED88TPLUS support a connection to a PC and recording of the RF measurement. This feature is usually available in high-end meters. but now available also on the CORNET ED88TPLUS. In order to operate this feature, you need to connect the meter to the PC via MICRO USB cable (recommended directly to the PC and not via USB Hubs), install the drivers(on USB to UART mode), install and run the software. At first, some people can find it hard to follow all the info on the LCD (but it also have a led light bar to make it easier at first).. The CORNET ED88TPLUS is highly recommended, great all in one home meter for those who like to have detailed LCD display with nomaric values. Signal : Analog RF(AM/FM) and high speed digital burst, RF, GSM, TDMA, CDMA, PCS, Wi-Fi 2.4GH, 5.8GHz, 3.6GHz WiMAX, 3 - 6GHz Ultra-Wide-band, 3G, 4G and AC smart meter. AC high voltage power line, Transformer, Motor, Appliance. EMF Display mode: dBm, mW/m2, V/m, uT, mGauss, MHz. The Acousticom 2 is a very simple to operate and very nicely built, very light and very small, RF detector, manufactured and sold by EMFields.com. This very basic RF detector is idle for people who don't want to mess with reading fast changing numbers or for presentation and videos, as the reading is very clear. It is also equipped with a build-in speaker which sounds the RF signal modulation, allowing you to identify the type of the RF radiation being measured. It comes with a carry pouch, a short user manual, and a 9V battery. Very sensitive (as low as 0.01V/m, up to 6V/m). Very nice, small, light RF detector for the novice user. Use the links in the below table. Sold be a web store in England. Prices are in British Pounds, not including VAT. You may need to pay taxes on supply. 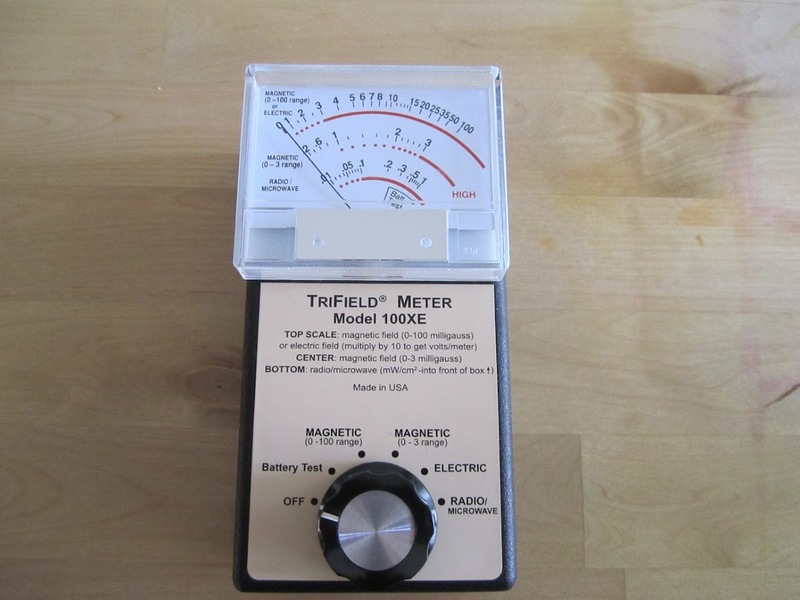 The MagneMeter ELF Detector is a very simple to operate and very nicely build , very light and very small, ELF magnetic field detector, manufactured and sold by EMFields.com. This very basic ELF detector is idle for people who don't want to mess with reading fast changing numbers or for presentation and videos, as the reading is very clear. It comes with a carry pouch, a short user manual and a 9V battery. Very sensitive (as law as 0.02 uT or 0.2mG). Very nice, small, light ELF detector for the novice user. Use the links in the below table. Sold be a web store in England. Prices are in British Pound, not including VAT. You may need to pay taxes on supply. An ELF magnetic & electric fields detector for home use. Detect both ELF Magnetic (in mG) and Electric (in V/m) fields from 20H-50000Hz. Very sensitive (as law as 0.2mG and 5V/m). 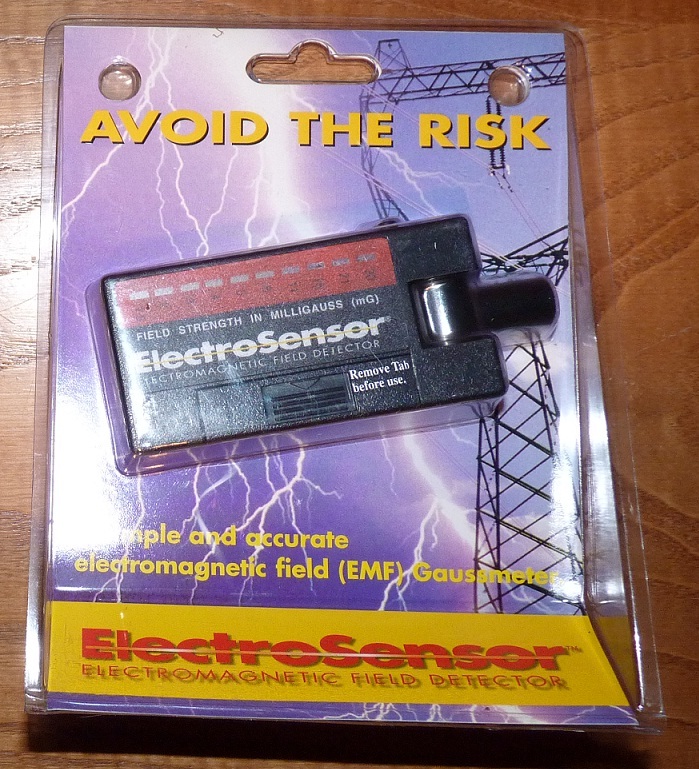 Very nice, small, light ELF detector for both Electric and magnetic fields for the novice user. The Acoustimeter AM-10 RF meter is a digital RF meter that can measure between 200MHz up to 8GHz. 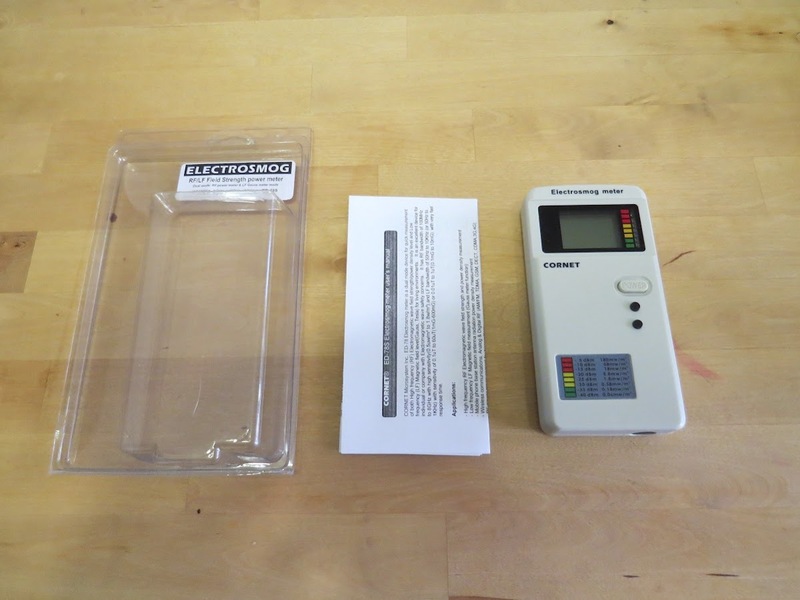 The meter comes in a hard plastic hand carry case in which it is covered with an RF blocking cloth that can be used also for demonstration. The Acousticmeter has both a 2 line LCD and 2 sets of color led strength bars and a LCD display in which you can see the Max RF electric field measured (since power-up) , the Current electric field strength (both in V/M) and the Average electromagnetic power density flux in uW/m2 units. The left led raw display the peak RF electric field in V/m units and the right led raw display the average RF power flux in uW/m2 units. On the left side of the meter, you will find the on/off switch, a volume dial and a headphone jack (for audio feedback). On the back of the meter, you will find the audio speaker and the battery compartment (2 AA batteries) . Both peak and average (average is done over 1024 samples which are taken over 0.35 seconds). Fast (for fast changing sources). Very good, easy to use RF Meter, very good for demos and videos. Recently I have decided to add some of Gigahertz Solution RF meters since they have become very poplar in USA, Canada and EU. These meters are very accurate, very sensitive, very fast and very "German"(made in Germany). Their operation is not so simple as you need to use switches, Attenuators, external antennas and etz, but they allow a lot of flexibility in the measurement. To this day I have not used them my self but you can experience the operation of the meter from the video above. Very low dynamic range. Measure between 0.001mW/m2 to 1.999mW/m2. Not very useful for everyday life. To measure levels higher than 2mW/m2 you need to connect an additional filter that makes the operation of this meter even more complexed. 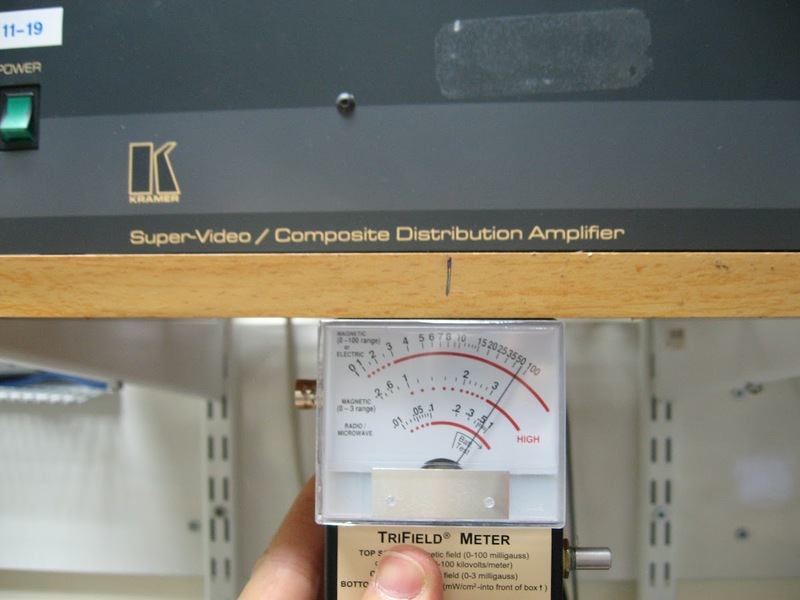 Good meters to those of you who know their way around RF measurements and needs the flexibility that these meters allow. The RF EXPLORER is a very cheap, low cost, very nice RF Spectrum analyzer. The key feature of this device is to show you the signals over the frequency span (RF meters show signal over time). Perfect for the semi-professional user and for activists and EHS people that know their way around RF signal analysis. It is not for every user as the operation and understanding of the display require some knowledge in electronics and RF signal formation. Very cheap in comparison to other RF Spectrum analyzers. USB Connection for charging and data transfer to PC. Shows RF signals over the frequency span. Need basic knowledge in RF signal analyzing. Important notice - In the past, I have found some accuracy issues with this meter. The meter tends to show higher levels compared to other meters when measuring ELF levels next to a small source. Test I did showed that this meter measures the right levels (as other meters) when in a large ELF magnetic field, like those created by high voltage power lines. I think this meter would be good for finding ELF sources and for background level measurements in large fields. If you need to measure ELF magnetic fields from small sources this meter may not be your best selection. This Extreme low-frequency meter measures ELF magnetic fields around 50 Hz (from 30 to 2000 HZ). This meter is equipped with big, clear and easy to read (date and time are not easy to read) LCD display, it can measure all 3 axis, it measure ELF EMR in mG and uT unit (configurable), and it can measure up to 1000 (!!!) mG (very nice!). The TENMARS 192D has several more advanced features such as the HOLD, HOLD MAX, HOLD MIN features, data logger memory (up to 500 measurements can be stored on the normal model and up to 9999 on the 192D model). It has an internal clock and date, auto power off feature, low battery indication. In the TENMARS192D you will also find a USB PC connection that will allow you to extract data from the meter. This advanced meter is very easy to operate has many nice advanced features. However, when compared to other meters it showed different values. The numeric display is very easy to read but I feel that it is not as easy to use for source tracking and finding as for the analog display that exists in other meters. Big clear numeric LCD display. Goes up to 1000 mG! Comes with a nice handbag. May not be so accurate in some cases. If it would have has a better LCD refresh rate, and if it would be more accurate, it would be perfect! If you need a simple to use advanced digital ELF EMR meter the TENMARS 192D is your best choice, but until the accuracy issues will be fully resolved I can't 100% recommend this meter. It is nice; it's big and seems to be a "professional" meter, but I rather use other meters. I think this meter would be good for finding ELF sources and for background level measurements in large fields. If you need to measure ELF magnetic fields from small sources this meter may not be your best selection. The sampling rate is too slow - meter could not identify fast changing signals (WIFI, DECT). Very disappointing (seems like a very good package but it is not). On paper (feature list) seems like a great deal but it was a very big disappointment for me. As in photography, a good RF professional tester would manage to get good outcomes from every meter. The problem is that I don't think that home level user will know how to handle this meter and to compensate for its problems and issues. But the slaw sampling rate (one per 0.4 seconds) which make these meters slow for most modern home use RF sources like WIFI, DECT, BLUETOOTH, Cellphones and other. I hope that in the future TENMARS will improve this very basic feature so the measurement will be based on at least 1000 samples and will show MAX value. It took me a while to understand what this detector does(an I am still not sure). I used it several times without understanding what exactly this device detects. Sometimes when you move it, it shows reading and beeps (maybe DC magnetic field? ), sometimes when closed to an electrical wire it beeps and shows a reading (maybe an AC electric field? ), I am still not sure. The manual gives no new info or a hint, it says "Electromagnetic radiation" all the time, without noting which type of EMF is it. In the pictures Below you can see a measurement next to a led strip that should have created an electric field (DC/ELF) next to it. In the first picture the meter shows no levels, in the next picture, where the meter is just a few mil-meters away from the previous spot, it does show some reading. According to the measurement of other meters, the EField should have been detected also on the first spot. I am still not sure what it detects. my best guess it is ELF electric field. Sometimes shows a reading when moved. Shows what could be ELF Electric Field reading (units unknown) only when very close to a device. I can't recommend this device. I am not sure about the full name or the model number of this device. I have seen it under different names and brands over the Internet. Mine says only "Electromagnetic Radiation Tester", and the user manual says "Version: 3120-EN-00". The device itself is very nice for a very low price. But in my testing, it proved not to be accurate enough to be regarded as "a meter". I think it is a nice ELF Electric and Magnetic fields detector. Not for RF. As in other cheap devices, it reacts to the radiation only when being very close to the source. However, it can still be used to scan a wall or a room (you need to be very close to the source, and even if you are it seems that the measurement is not accurate). The manual say it can go up to 3500MHz, well I could not see how it can. I put it next to a working DECT phone, it did show a high level of Electric field, but the same level was seen when the DECT phone was out of the power socket( I am not sure what it measured in this test). So I am not sure, but is was not as responsive as I would expect it to be. In addition, the manual says it's E-fields sensitivity is as low as 1V/m. This could be fine for ELF but not sensitive enough for RF. In the pictures above, 0(none) then mid(10V/m) then high(344V/m) readouts of electric field just few cm. a way from the source. In the pictures above, Left picture, no ELF magnetic field is detected from an audio amplifier. In the middle positioned picture, 3.21uT magnetic field just 5 cm from where the meter was in the left picture. In the right picture, the UHS2 shows a level of 10mG (1uT) farther away from the amplifier. Lots of features (Hold, Average, Peak value, backlight, alarm). Not accurate enough to be called a meter. Reads high levels only when next to the source, 10 cm away and the readout is 0. Does not seems to pick up RF radiation (the manual suggest that it can go up to 3500MHz). I think it may be used only as a cheap ELF Electric and magnetic fields detector if you can't afford a more accurate reliable meter. Magnii MT-263 - coming soon! Magnii DSP-523 - coming soon! 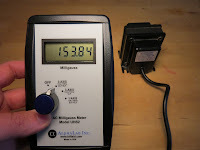 AC MILIGOUSE METER UHS - coming soon! Green – OK for long exposure. Yellow – OK for short exposure, not for long. Red - high levels of EMR, stay away if possible. On the right side of the CORNET ED-6 there is a small On-Off switch. 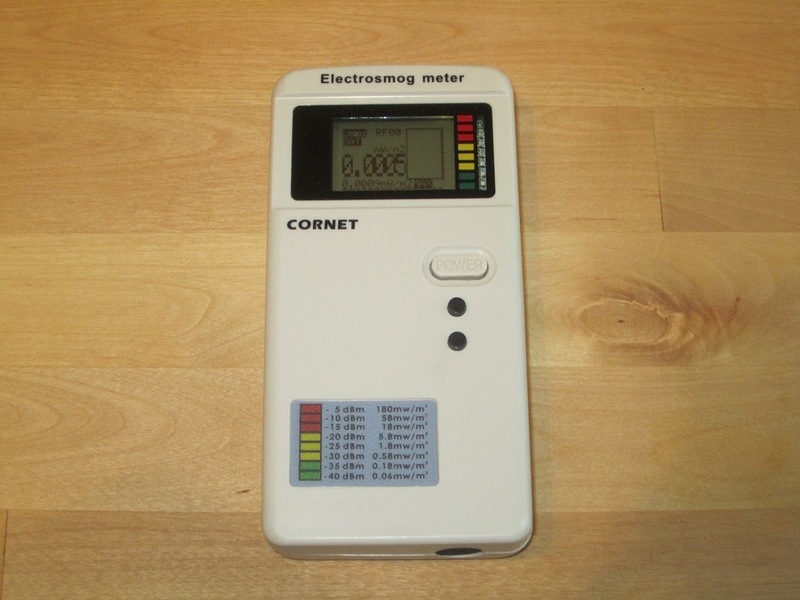 The CORNET ED-6 is best to be used as a basic meter that can reveal the levels of EMR (none, a lot, some EMR) , for searching and exposing EMR sources and for monitoring your environment for several hours. A similar modal with addition of voice indication is also available. The CORNET ED-6 uses a 9V battery which will last for more than 8 hours (tested by me). It is recommended to use rechargeable batteries in order to save single use batteries. 2 screws, in the back of the CORNET ED-6 will allow you to open the device and to change the batteries. I connected to the battery connection to the power output of a 9V power transformer, and I use this meter as a 24X7 EMR level monitor. Battery lifetime of up to 8 hours. Small, light and easy to operate. Mobile (you can take it any place you like). It seems like a Strong device. Gives only an estimation of the EMR level and no numeric reading. 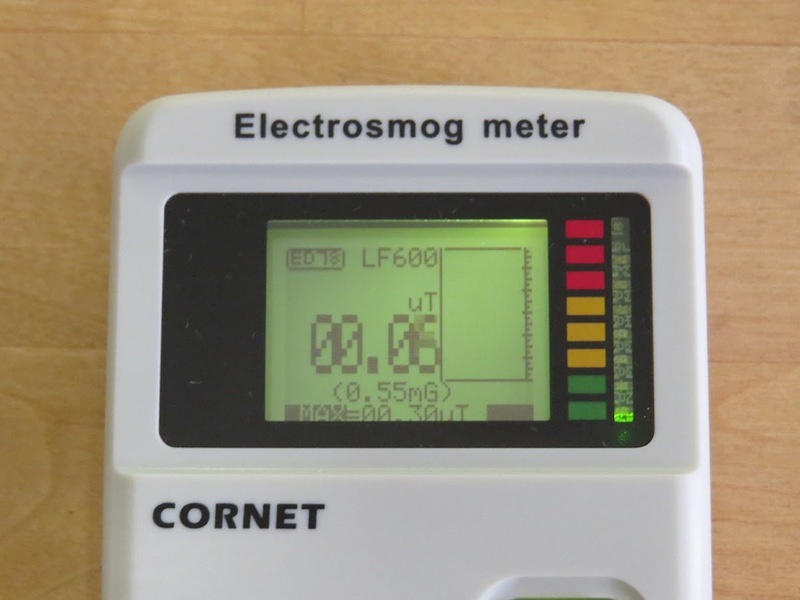 I recommend the CORNET ED-6 meter as a first, simple, small and mobile meter, for beginners and for people who do not want to deal with complected numeric info, just a basic EMR level meter. 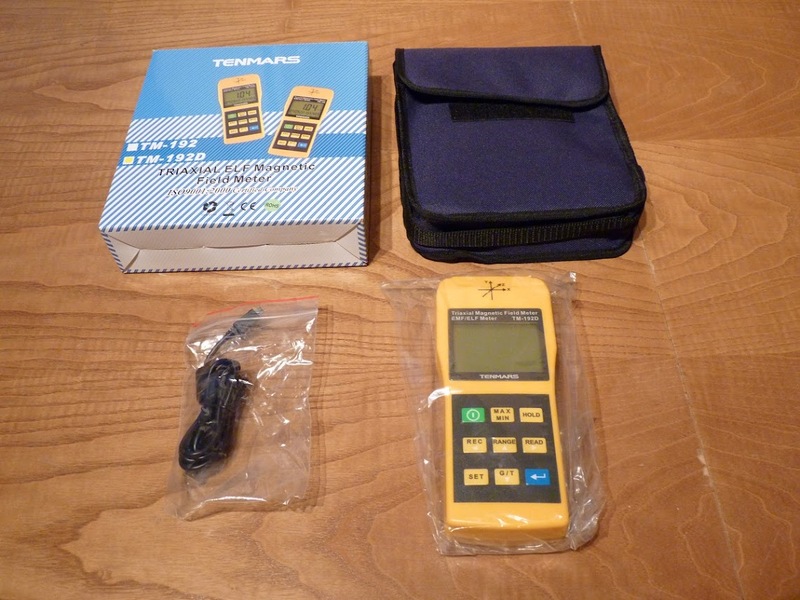 It is recommended to purchase together with a similar LFE meter. Replaced by the CORNET ED78! The CORNET ED-25G is a EMR meter for both RF (radio- high frequencies) and LFE (low frequencies) , with a Digital numeric LCD that displays diverse types of information in addition to a color led light EMR level bar. It can measure RF in frequencies between 0.1 and 3 GHz (100-3000MHz), and LFE between 50 Hz to 10000 Hz. In RF it can measure from 0.0018 mW/m2 to 0.58 W/m2, In LFE it can measure from 1 mGauss to 600 mGauss (all in only one axis). EMR value in W/m2 (big digits). EMR value in dBm units (small digits). Histogram graph with last 32 measurements (a measurement is done couple of times for each second). EMR level bar, both on the lower part of the LCD and on the side of it using the Led color EMR level bar. LFE EMR value in micro Telsa (uT, big digits). LFE EMR value in mGauss (small digits). Max value (since power up). Histogram graph with last 32 measurements (a measurement is done a couple of times for each second). EMR level bar on the side of it using the Led color EMR level bar. A big On-Off button is located under the LCD and above the 2 function buttons in the front of the CORNET ED-25G (gets pressed very easily when the meter is in the bag of not in use). Pressing the top function button of the CORNET ED-25G (lower than the power up button) will switch between ELF to RF. The lower operational button of the CORNET ED-25G is used to freeze the display on the last measured value (Hold function). 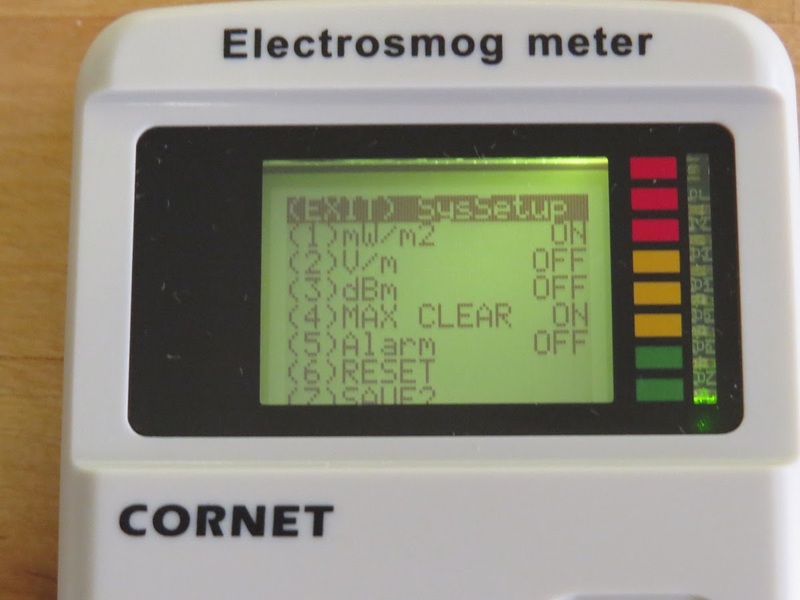 The CORNET ED-25G is equipped with a backlight for the LCD display, which is on for several seconds after power up and can be turned on (for several minutes) by pressing the upper operational button while in HOLD mode. The LCD back light makes it possible to use the CORNET ED-25G at night and in poor light conditions. The CORNET ED-25G has an internal antenna. It uses a 9V battery (easy access from the back of the CORNET ED-25G). The battery kept the meter working for more than one hour with the backlight on. I recommend having a spare battery or even several rechargeable batteries if you use the CORNET ED-25G more than once in a while. LFE and RF in the same meter. A lot of info on the LCD. Not very sensitive in LFE (displays the right values but only when very close to the source). 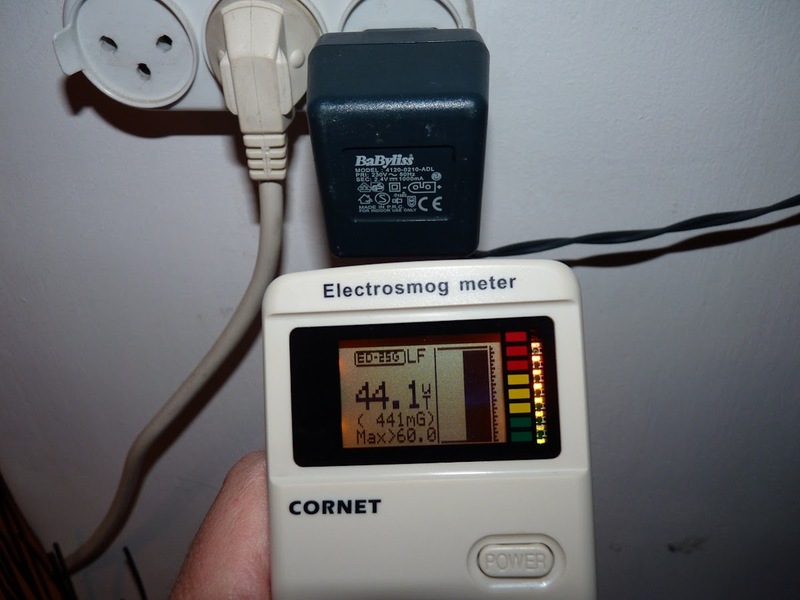 The CORNET ED-25G is recommended if you are looking for a dual ELF and RF meter , for home use, and if you are not afraid from a lot of data being presented on the same small LCD at the same time. Most recommended, all in one, home use, RF/ELF-M/ELF-E EMF meter (01-2016)! Average can be selected to show Avr over the last 0.5 second or of the last 15 seconds. Low price recommended, home use, RF/ELF-M meter! An improvement of CORNET ED75! All in one, both RF and ELF in the same meter like the ED75 and the ED25 but this time with improved frequency range (up to 8GHz), audio feedback and alarm, Average, max and current measurement. Very Fast RF meter (most important for an RF meter, 3500 measurements for every half a second and displaying the max level measured in the last half second). ELF mode LF30 - from 40 to 1000Kz and up to 10mG (very sensitive ELF mode). Histogram graph (level/time graph) showes the values measured on the last 15 seconds. Helps you see fast signals and how the radiation levels changes over time. Great for RF/ELF source hunting. The CORNET ED-78G is highly recommended for first meter. The extended frequency range and the audio feedback makes it even better than the CORNET ED 75 (see below). Best first meter for both ELF and RF! The CORNET ED-75 is a EMR meter for both RF (radio- high frequencies) and LFE (low frequencies) , With a Digital numeric LCD that displays diverse types of information in addition to a color led light EMR level bar. It can measure RF in frequencies between 0.1 and 6 GHz (100-6000MHz), and LFE between 50 Hz to 15000 Hz. In RF mode it can measure from 0.0005 mW/m2 to 0.58 W/m2, In LFE it can measure from 1 mGauss to 600 mGauss (all in only one axis). The CORNET ED-75 is highly recommended for first meter. It can detect both ELF and RF sources. The meter is for home use, and if you are not afraid from a lot of data being presented on the same small LCD at the same time. 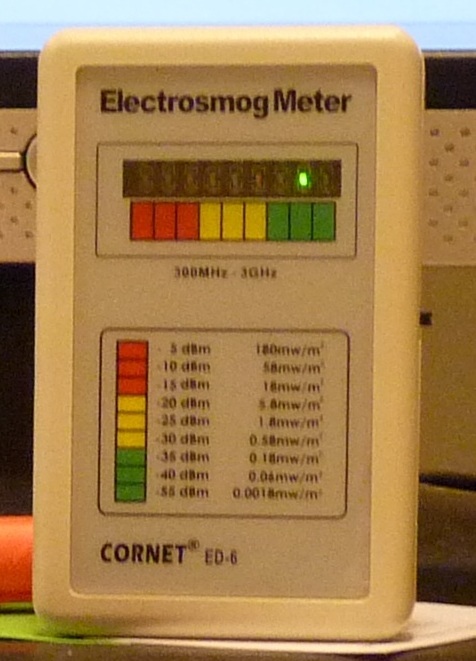 The CORNET ED65 is a single axis RF meter for frequencies between 100 MHZ to 6 GHz. It has a digital LCD display with a lot of information and in addition a color bar led display. 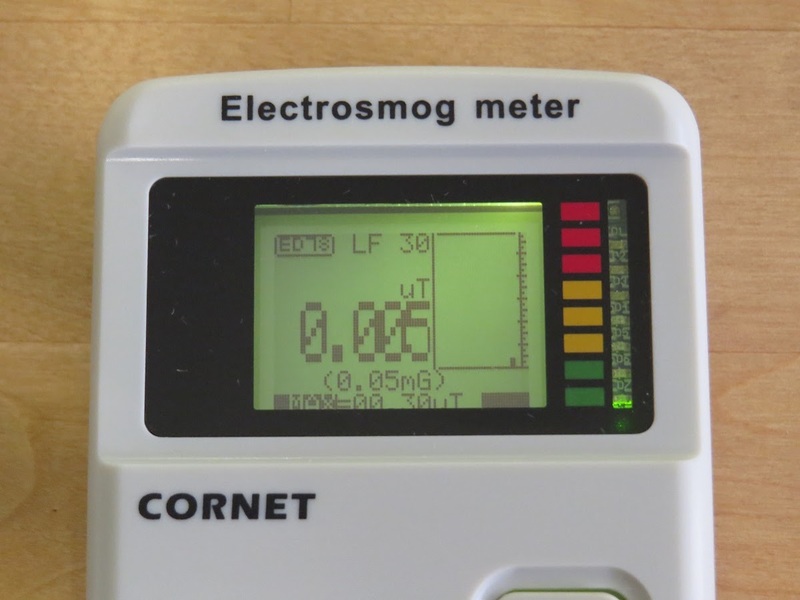 The CORNET ED65 can measure from 1 uW/m2 to 0.58 W/m2. 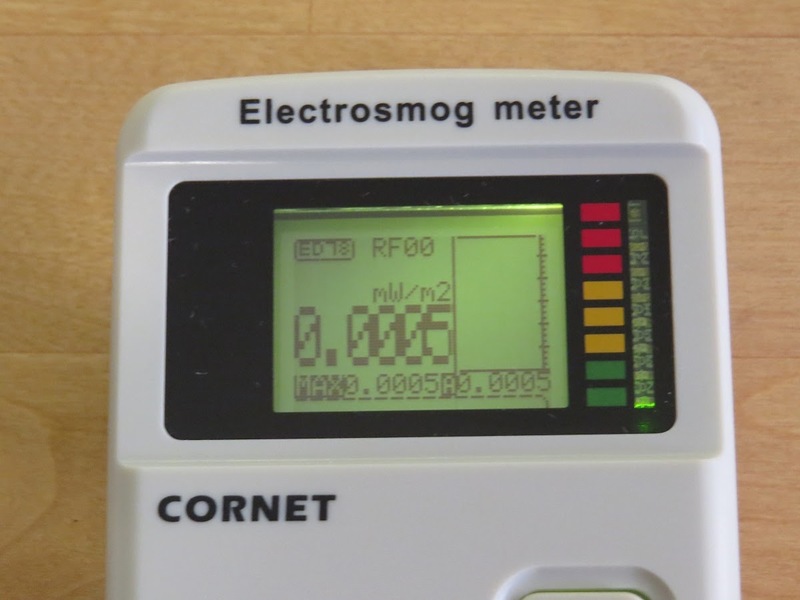 On the CORNET ED65 LCD you can fine the level of the EMR represented in several ways, In large numeric digits the CORNET ED86 can displays both the dBm units the uW/m2 units (user can chose using upper operation button). On the right side of the LCD the CORNET ED65 displays the last 32 measurements values into a histogram shape (couple of measurement are done every second). In addition there is a led color bar next to the right side of the LCD. The histogram gives the operator a very good indication of the EMR levels over the last few seconds and makes the job of finding EMR sources much easier. The CORNET ED65 is equipped with a back light for the LCD display, which can be turned on by pressing the upper function button while in HOLD mode and which is automatically turned off after 20 seconds. The LCD back light makes it possible to use the CORNET ED65 at night and in poor light conditions. The lower button is used to freeze the display on the last measured value (Hold function). A big On-Off button is located under the LCD and above the 2 function buttons in the front of the CORNET ED65 (gets pressed very easily when the meter is in the bag or not in use). The CORNET ED65 has an internal antenna and it uses a 9V battery (easy access from the back of the CORNET ED65). The battery kept the meter working for more than one hour with the back light on. I recommend having a spare battery or even several rechargeable batteries if you use the CORNET ED65 more than once in a while. Display of Max values (only in some models). The internal antenna saves place and makes it easier to store and move the meter. Cheaper than the ED85 and the ED25. Short battery life, better to have rechargeable batteries. The CORNET ED65 will suit you if you are looking for a RF meter for up to 6 GHz, and if you are not afraid from a lot of data being presented on the same small LCD at the same time. It is cheaper than the ED85 and the ED25. New version is faster and includes audio feedback! The CORNET ED85EXS is a new version (forth generation) of the old ED85. It is a single axis RF meter for frequencies between 1 MHZ to 8 GHz. It has a digital LCD display with a lot of information and in addition, a color bar led display. The CORNET ED85EXS can measure from 0.1827 uW/m2(-65 dBm) and up to 1827 mW/m2. The COM –Environmental Microwave Monitor has an internal antenna and uses a 9 V battery that can be easily changed without taking the all device apart, but it is not always easy to close the battery cover. Thanks to the auto turn off feature battery life is very long. In my humbled opinion the COM's color bar does not reflect the safe, moderate, high values since even when a single green led is on (lighted), the EMR levels are too high for long exposure. The COM comes with 2 years guaranty (in England). Automatic shut down after 1 minute operation. Very easy to operate and read. Measure electric field (which is seldom used today). Green light is not safe. 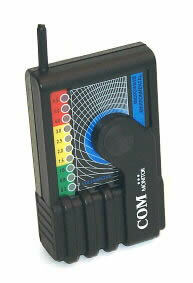 I recommend the COM as a simple EMR meter for demonstration needs (very easy to read display). The ELF Electro Sensor is an Extreme Low Frequencies around the 50 Hz, in a single axis. The ELF Electro Sensor has a led light color bar indication (green, yellow, red). The led indication marks the level of ELF EMR from 1.5 mGauss to 30 mGauss . The ELF Electro Sensor has a single operation button that has to be pressed for several seconds before the meter turns ON and you have to hold this button pressed as long as you want to measure the ELF EMR levels. When the ELF Electro Sensor is ON the led lights will show the levels of ELF EMR (only a single led will light to show the ELF EMR level). The ELF Electro Sensor can give a basic indication of a lot, mid or low level or ELF EMR and can be used for finding ELF EMR sources in the house. The ELF Electro Sensor is very basic and very easy to operate, the display is very simple and very easy to read but it is not suitable for evaluation of safety distances. When compared to other single axis and 3 axis meters it showed lower ELF EMR levels half a meter from the source. Can be bought in a bundle with a similar RF meter. 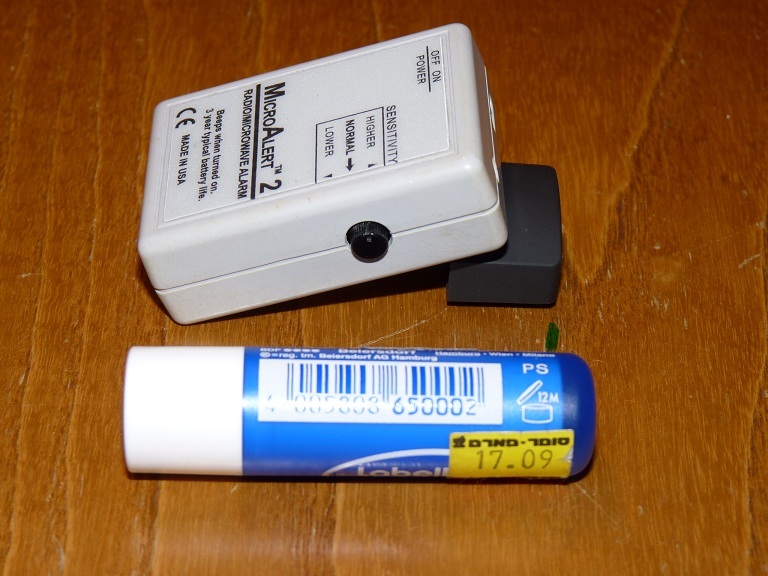 The ELF Electro Sensor uses a 1.5 AAA battery that can be replaced easily via a special cover. Able to find and expose ELF EMR sources. Not suitable for evaluation of safety distances. The ELF Electro Sensor is recommended as a first ELF meter for amateurs, beginners and people who want a basic meter for ELF EMR and want to avoid complicated to read LCD display, for finding and exposing ELF/EMR sources. The CellSensor is a very simple high and low-frequency electromagnetic meter in a single axis . It has a single On-OFF operation button, a On-OFF indication light, analog scale and on the back side there is a small door for access to the 9 V battery. 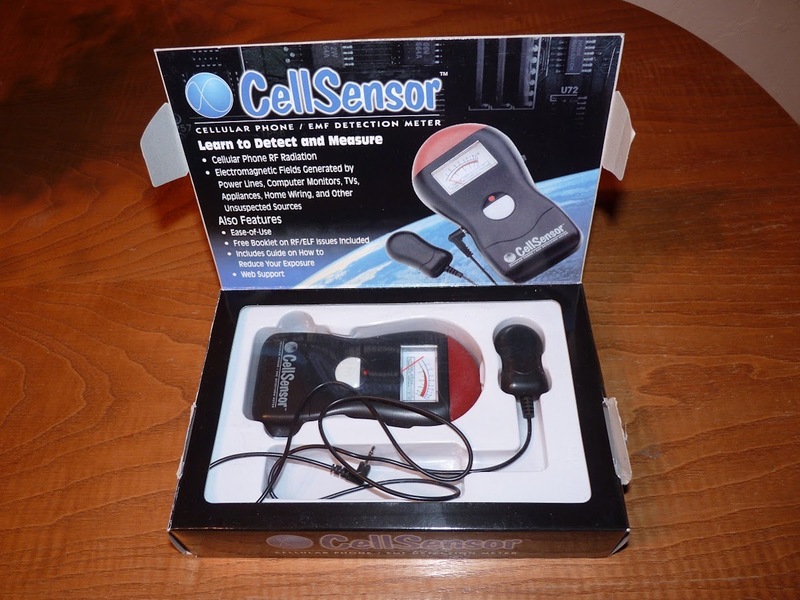 The CellSensor has a red color cap (red light is on when radiation is sensed) and a voice indication. In the right side of the CellSensor there is a sensitivity selector, which allows you to select between high (X10) or low (X1) sensitivity mode. In the box you will find a sensor probe that needs to be connected to the CellSensor meter in every use. 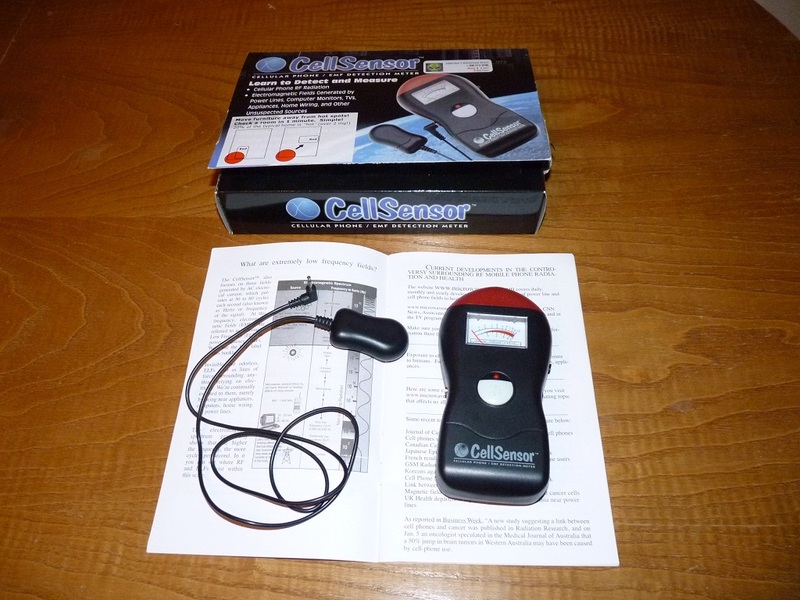 The best thing about the CellSensor meter is the user manual that comes with it and that other than operational instructions it also has a lot of information and explanation about electromagnetic radiation of different types, possible sources, the right way of measuring it and also a lot of reference to other information available over the internet and in books. In high frequency, it can measure from 0.1 uW/cm2 to 10 uW/cm2 (high levels), and in the low frequency, it can measure between 1 and 50 mG. 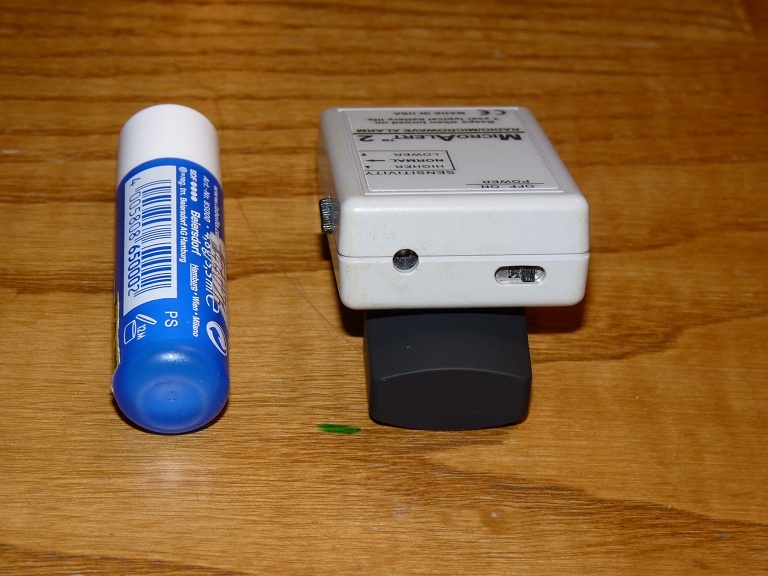 The CellSensor meter uses a 9 V battery that can be changed without taking the device apart, using a special cover. Limited sensitivity in high frequency (from 0.1 uW/cm2). The probe must be connected when in use. Only for the detection of electromagnetic radiation sources. For those who want a very simple EMF detector for both LFE and RF in less than $50. Please note, in some of the pictures and video in this site appears a more advanced model of this meter. 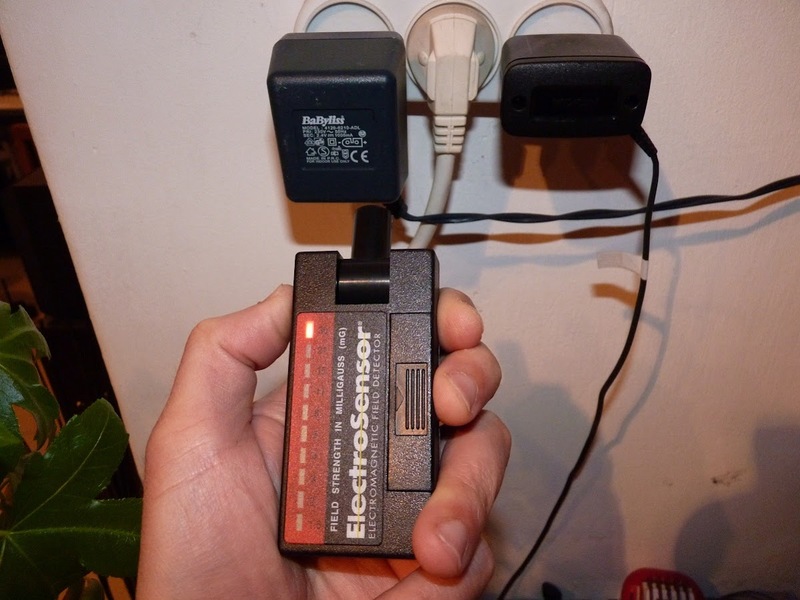 Highly recommended as a ELF meter (magnetic fields from electric power line, electric devices, power converters)! One of the best low-frequency EMF meters for home use. 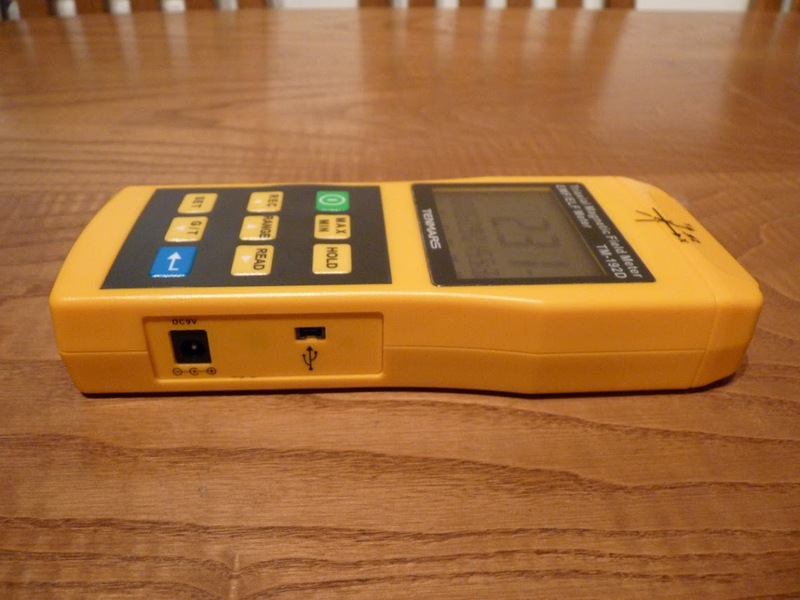 1.2 What can an EMF Meter \ EMR meter allow you to do? 1.3 What is important in EMF meter\EMR meter? 1.4 What an EMF meter\ EMR meter can't do? 1.6 One meter for RF+ELF or a single meter for each? 1.26 Magnii MT-263 - coming soon! 1.27 Magnii DSP-523 - coming soon! 1.28 AC MILIGOUSE METER UHS - coming soon!